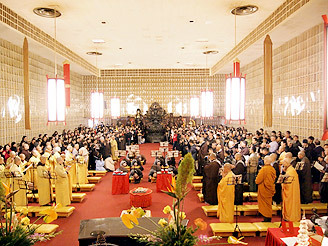 On Sunday March 20th, the City of Ten Thousand Buddhas [CTTB] opened the day with a joyful celebration of the anniversary of Guan Yin Bodhisattva. That same afternoon at 1:00 pm, the President of the Board of Directors of Dharma Realm Buddhist Association, Rev. Heng Sure; Abbot of CTTB, Rev. 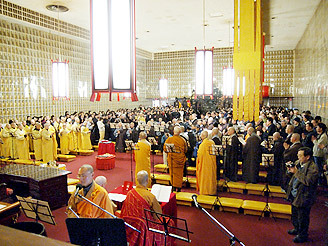 Heng Lyu, along with Bhikshunis Rev. Heng Hsien, Rev. Heng Liang, Rev. Heng Syin, and Rev. Heng Re, presided and ceremonially performed the solemn and formal hair shaving ritual. The new novices - four good men and eight good women - all brought forth a compassionate and resolved Bodhi mind, determined and eager to become official members of the DRBA Sangha community. Hundreds of guests came from long distances to participate and to witness this historic event. Despite the high winds, heavy rain, and somber gray sky, the crowd colored the worship atrium with enthusiasm and good wishes, overflowing the hall with energy of utmost sincerity. With the greatest refinement and deportment, they helped mark a profound moment on this day rich in the CTTB monastic history. 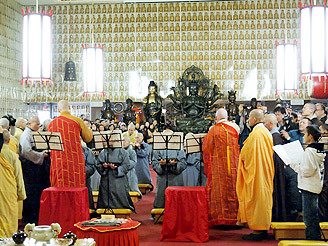 The majority of well the wishers were guests and relatives of the new monks. Acknowledging this historical moment, they brought along and offered to them their sincere and warmest wishes. In the case of Qin Wei Shi, his entire family was mobilized, together with over fifty of his friends; his eighty-nine year old grandfather specifically travelled to cheer for him. Suffice it here to say that his extraordinary affinities are impressive. Originating from Viet Nam, Qin Ming Shi managed to rally his Seattle based mother and close relatives to join him in this celebration. Influenced by the serene and holy atmosphere, besides showing support and keeping up with the spirit, the relatives decided to extend their stay to include the 7 day Guan Yin Bodhisattva recitation session to this trip. Qin Zhu Shi's significant other and daughter from Taiwan also came rushing in to the ceremony to cheer for him. Rush Previously, his other two daughters had paid a visit to him during this past winter break. Delighted by the fresh look and genuinely proud of the wise decision made by their father, they fully supported him and echoed the same great spiritual sentiment. Although Guo Shun Shi’s mother was not in attendance, her presence was felt half way around the world from the Purple Cloud Cave Monastery of Malaysia, where she currently resides awaiting for her own celebratory day to be part of the future novitiate ceremony. Prior to this date, the male novices had completed a very rigorous training program which lasted nine months. 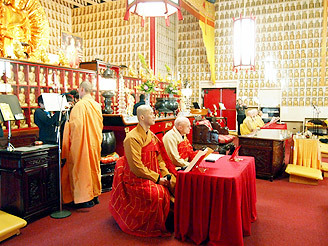 At Tathagatha Monastery, they cooperated and coexisted with the senior Sangha members to acclimate to the simple monastic lifestyle, pursued different classes such as disciplinary precepts, studied the Exhortation of Resolve Upon Bodhi, learned about the Venerable Master's legacy, and other subject areas. The goal of this pre-novitiate training program is aimed at helping them to rid themselves of old prejudices, recognize and let go of worldly desires, change unbeneficial habitual tendencies, generate more inner strength, and finally be prepared for official entry to monastic life, and beyond. Equally important in this process is the women's two-year minimum resident-in-training. Throughout this time, besides learning the appropriate deportment and manners of a future Sanghan, these aspirants were required to attend regular lectures on disciplinary rules and conducts, trained at different locations, worked constantly under challenges, lent their full support to the daily operations of the branches, committed themselves to learn in and through community, all for the ultimate purpose of positioning themselves to be ready for their future vocation. Long-time resident of Long Beach Monastery, Jin Xu Shi, prior to leaving home, fulfilled her filial obligation in caring for her mother, Dharma Master Heng Ji, who herself was part of the 1984 group of novitiates and has resided in the same monastery since. Jin Xu Shi recounted that Venerable Master Hsuan Hua appeared in her dream. Kneeling on the floor she begged: "Shr Fu, help me, Shr Fu, help me, I want to leave home!". As compassionate as always, Venerable Master smiled, patted her head and replied, "Yes, come, you are my good girl" acknowledging her will to pursue the Way. In the absence of the Venerable Master's physical body, his Dharma body is neither present nor non-existent but He can constantly hear and tirelessly fulfill every wish of living beings. At the closing of the ceremony and moving on in the application of duty, each of the eight shramenerikas will be reassigned to different locations to continue their training. This method is to help strengthen their courage and self-reliance by placing them in various situations and familiarizing them with different cultures, traditions, doctrines, and languages, training them to learn and share their experiences with their peers., In the early years of DRBA, sudden, impromptu transfers happened often. without time to pack, much less plan. This approach is part of the "letting-go," "non-attachment" training curriculum, reminding us that life is in constant flux, a flow of change in which impermanence rules. The average age of this novitiate group ranges between thirties to forties. Most of them hold graduate and post graduate degrees. The addition of these young new members with their fresh energy and ideas revitalizes the existing Sangha community; it enhances and extends the Buddha's teaching farther and wider. This wave of new young faces is an encouraging resource and model to the many spiritually eager young adults in their determination and pursuit of a future ascetic life as monastics. Capturing the mood and the historic significance of the ceremony, guests and young students of the campus photographed prolifically. To the young mind, leaving home is a novelty and a phenomenon. But the implication of this is even more phenomenal when their mind is being fundamentally Bodhi-seeded with the significance of this momentous event. As an ancient quote reveals: "Underestimate not leaving the home life, for the today's fruit is the hard work of many past lives' labor of Bodhi-seeding" Today, in a world where most people drift on the current of purposelessness, these twelve novices have found their home. Beside realizing their personal goal, they have left this spiritual door opened wide for all of us to enter and sent a strong message encouraging many others to follow. We firmly believe that in the near future, they will become a vital force, totally focused and consumed by a single monumental mission, to offer the greatest gift to mankind: the Dharma. Unconditionally, they will offer all of it, and to all.